For those of you who don't know, StackOverflow is a programming question-and-answer site and the first site in the League of Justice of sites running the StackOverflow Engine. The premise is pretty simple. People go to the site and ask and/or answer questions about programming. There's also a reward system where good questions and answers get voted up and bad questions/answers get voted down. If something you wrote gets voted up, you earn reputation points. The more reputation you earn, the more privileges you get on the site. There are also XBox-Live-style Badges awarded for various, generally positive, behaviors. The whole experience can be quite addicting and the quality of information on the site is pretty high. Lately though, I've started noticing a lot more of a specific, unfortunate, behavior type. My favorite term for this type of person is a help vampire. I'm sure everyone is familiar with the basics. The endless questions with no sense of appreciation for those answering. The overbroad, do-all-the-work-for-me, attitude. I believe that, in general, people want to help other people. There's no way that StackOverflow could succeed if that wasn't true. When I'm answering questions on StackOverflow, there are a couple of things I look for (and that I try to do myself, when asking questions). #1 That the person asking the question is putting in some effort. That means asking a specific question that can actually be answered. That means no questions like "How do I write a chatroom in C#?". appreciates that they are getting help. In the case of StackOverflow, that means voting up answers you like and accepting your favorite answer. I'm going to go ahead and pick on a specific user who is a fantastic example of all the negative behaviors I've been talking about. I have some screenshots of the profile statistics from about a week ago. 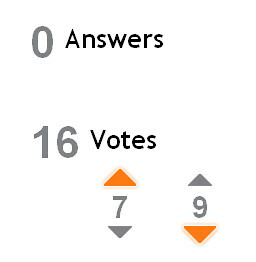 461 questions asked and only 7 upvotes. That means, out of all the answers to all 461 questions, this guy only found 7 answers worth voting up. Take a look at any question to see his "Accepted Answer" rate. Of those 461 questions, he's only found the answer he was looking for 39% of the time. I'm happy to see that, currently, his account has been suspended. There's nothing wrong with asking lots of questions but there's a right way to do it and a wrong way. And it doesn't get more wrong than this schmoe.